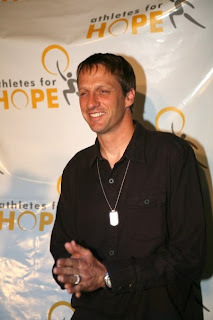 PMA Kid: Tony Hawk: Pro Skater, Video Game Maker and COOL GUY! PMAKid: I know that skaters listen to a lot of music. When my dad was young, it was stuff like Agent Orange and my friends 7 Seconds and other bands. What kind of music did you listen to then and what kind of music do you listen to now? Tony Hawk: I had the idea after visiting a number of new skateparks in 2001, and seeing that they were mostly built in affluent areas without proper guidance. In other words, the people building the parks didn't include the skaters in the design process and ended up making a park that was no fun to skate. I set out to change to change that cycle and try to get more parks built in low-income areas by providing funding and resources to communities in need. PMAKid: My dad was telling me about how he heard that one of the problems in getting skate parks built is that cities are nervous to do that because they are worried that if some kid gets hurt, the city will get sued. Donald Terry (the guy who is the school board member for my area) said there was a friend of his who has tried to pass legislation in California to help with this problem. Do you get involved with this? How do you deal with this issue when trying to get skate parks built? Tony Hawk: Legislation was passed nearly 10 years ago that put skateboarding on the "Hazardous Activities List," which is a very good thing. It means that people that participate in skateboarding do it at their own risk in public areas; thus removing cities from the liability after providing a skatepark facility. The biggest issue we face now is erasing the negative stereotype that skaters are irresponsible, but our track record speaks for itself. The skaters take care of these facilities and encourage the younger or inexperienced skaters to join them. PMAKid: I know from what Ms Lenore said that you have your own kids. How do you teach them to be drug free? Tony Hawk: By example. I don't preach it to them, I just try to show them that I could not be doing this stuff at such a high level if I was wasted all the time. And I have too many friends that fell off the skate scene because they chose drugs over their career. Some of them even died. PMAKid: You have to travel a lot, opening skate parks and promoting and stuff. How hard is it to be away from your family? Do you take your kids with you? Tony Hawk: Prioritizing my time is the biggest challenge of my life. I take my kids whenever it is appropriate, and I have plenty of time to spend with them and share the experiences of travel. Seeing them embrace different cultures is one of the best things about being a father and having the opportunities that I do. PMAKid: When you face tough times, how do you keep a Positive Mental Attitude (PMA)? Tony Hawk: I believe that I can overcome whatever burdens me, and consider setbacks or problems more as challenges and learning experiences. Adversity makes you more resilient and prepared for the future. PMAKid: Aside from skating, what do you do to relax? Tony Hawk: Spend time with my family, doing "average" stuff like going to the movies, swimming, theme parks, and bouncing on our trampoline.